Ricci, Seymour de. The Gustave Dreyfus Collection. Reliefs and Plaquettes. Oxford, 1931. vol.II, 232. Renaissance Bronzes: Statuettes, Reliefs and Plaquettes, Medals and Coins from the Kress Collection. Introduction by Perry B. Cott. National Gallery of Art, Washington, 1951: 145, as Madonna and Child. Pope-Hennessy, John W. Renaissance Bronzes from the Samuel H. Kress Collection: Reliefs, Plaquettes, Statuettes, Utensils and Mortars. London, 1965: no. 58. Palmer, Allison Lee. 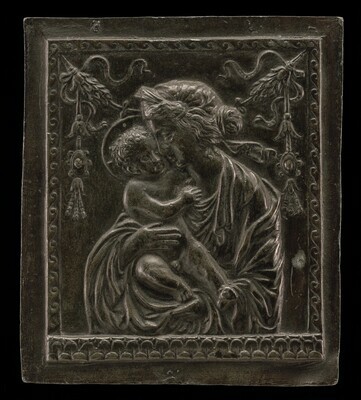 "The Walters' Madonna and Child Plaquette and Private Devotional Art in Early Renaissance Italy." 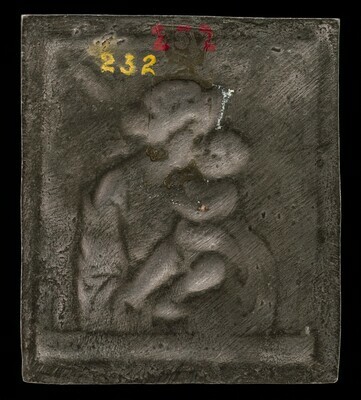 The Journal of the Walters Art Museum 59 (2001): 74, 75 fig. 4. Rossi, Francesco. La collezione Mario Scaglia: placchette. 3 vols. Bergamo, 2011: 1:77, under Prototipo, M.5, 78 fig. a, as by school of Donatello.